Let us talk about video games based on license property. We all know that 90% of the times, license games are utter garbage, and the people who made them should be ashamed that they made such a low quality game. However, we do have a list of good license games. You just need to dig through the piles of inferior games to find the good license games. We are seeing an improvement with the quality of license games, but that improvement is coming at a snail’s pace. Anyway, we all know about the good Disney games, Telltale’s The Walking Dead, the Batman Arkham series, and Beetles Adventure Racing, just to name a few. However, I didn’t feel like talking about any of those. Instead, I am going to talk about a 1993 point-and-click adventure game from LucasArts called Sam and Max Hit the Road! 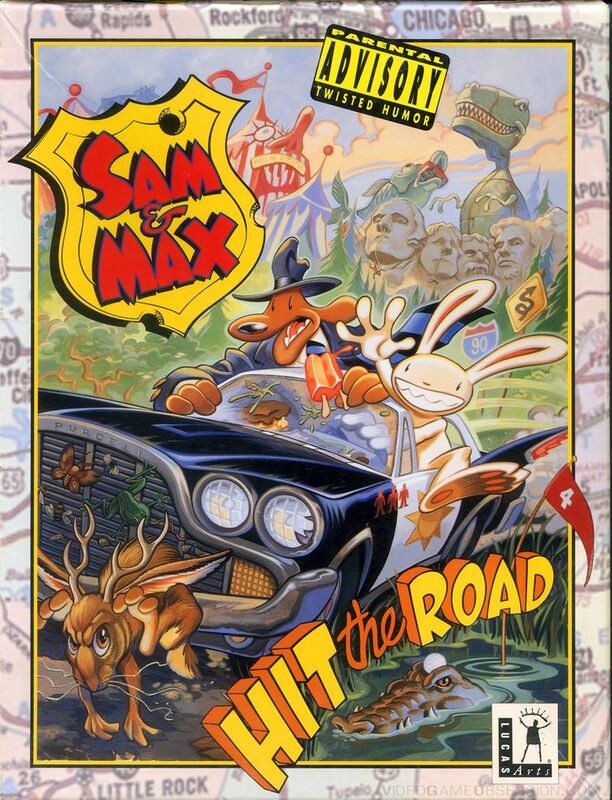 Originally released in 1993 for DOS and having a re-release in 2002 for Windows, Sam and Max Hit the Road was critically acclaimed and is considered to be a classic within the genre. How does it hold up today? Can this game based on the comic book still hold up? Read on to find out! The story revolves around the freelance detectives Sam and Max, voiced by Bill Farmer and Nick Jameson. After dealing with an assignment in the opening cut scene, they drive off to their next job at a carnival. They find out that one of the main attractions of the carnival, a Bigfoot named Bruno, has escaped with another carnival side show freak named Trixie. It is up to Sam and Max to find out where the heck Bruno and Trixie ran off to, even as they deal with a country western super star named Conroy Bumpus, who also wants to find Bruno. The story is entertaining, and I was invested until the very end to see what happens to the characters. The humor in the game is pretty well executed, but, like all styles of humor, you will either like it or you won’t. A lot of the jokes rely on the game’s witty dialogue. Sam and Max, as characters, are entertaining and have a certain chemistry that works between the two of them as they travel through the story’s many weird and absurd locations. Sam and Max Hit the Road is a point-and-click adventure game. You will be playing as Sam and Max going throughout the entire US of A, visiting many tourist locations. Instead of having a menu system like the first two Monkey Island games or Day of the Tentacle, it has a menu system that reminds me of games like Space Quest IV or King’s Quest V, where you will have a small list of actions to execute, like walking, talking, grabbing, performing an action, and you get the idea. The puzzles are inventory-based, meaning you will need to pick up a multitude of items that, at first glance, might be useless junk, but will end up being useful at some point within the game. The game’s puzzle logic is a bit on the moon-logic side. The solutions aren’t too farfetched, but you have to really think outside the box to solve some of them. Even though I said you play as Sam and Max, you will only be controlling Sam, while using Max to solve certain puzzles. The game’s length can be around the same length as other adventure games I have reviewed, and can be completed within a few hours, but due to the moon-logic used in certain puzzles, it may take a little longer than most games. Luckily, there is no dead-end or insane difficulty that brings the game down, unlike Sierra adventure games. The graphics are beautiful. The 2D animation is very detailed, and the 2D sprite art style still looks great 20 years later. The voice work is easily the best part of the presentation side of the game. The voice actors they chose are just perfect. Bill Farmer does a great job giving Sam a Humphrey Bogart kind of voice, and Max’s voice actor, Nick Jameson, also does a great job giving Max a slightly-unstable, but fun personality. The music is quirky and fits the entire cartoony mood of the game. One of the composers is Peter McConnell, who I have mentioned before, so I won’t talk about him too much here. The two other composers are Clint Bajakian and Michael Land. Clint has worked on games like The Bard’s Tale, Syphon Filter: Dark Mirror, and other LucasArts games. The same goes with Michael Land, who has worked on a majority of games from LucasArts. Sadly, this cartoony adventure game has some flaws. I don’t mind the moon-logic style puzzles, since they fit with the overall vibe, but the puzzles do not feel fluid. You are basically going back and forth to different locations to pick up items to combine with other items to solve a single puzzle. It is a little tedious, and I wish the puzzles flowed better within the story and the overall experience. The game’s pace is hurt by this, and it is just a shame. I know in a lot of adventure games you have to go back to different locations many times, but it happens a bit too much here. So, does this game hold up? Yes, it does. It might have moon-logic and pacing issues, but this is still a very playable adventure game. I would highly recommend that you get a copy of this game for any price you can. You should obviously get the disc version, since it has better sound quality and full voice work. I have seen the game range in price, but I wouldn’t pay more than $15 dollars or so with this specific game. The IBM compatible version, like what I have, will still need the scummVM program to work, but unlike the other adventure games I have reviewed, you also still need to have the CD inside your computer or laptop. I think the rereleased version gets rid of the requirement of needing the CD inside the computer, but I would ask around, since I am not the all-knowing guru of retro PC gaming. If you love zany cartoon antics, witty writing, and great voice work, Sam and Max Hit the Road will fulfill your needs.